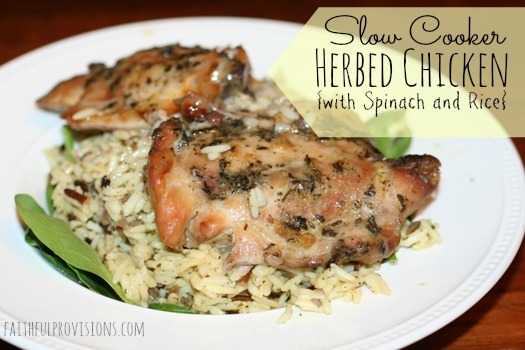 This slow cooker recipe for herb chicken was one of those wonderful accidents that happened on a day when I was just pulling things together. This dish actually originated as a pork recipe, but we really don’t eat much pork. I had some organic skinless chicken thighs in the freezer. There was plenty of boxed rice in my pantry. Some lovely, fresh spinach was in the fridge, so I decided to put them all together. This just might be one of my new favorite chicken recipes! You can use any cut of chicken for this recipe. However, if you want one that has more flavor, I would go with the dark meat and a cut with bones. (A whole chicken would be great!) What makes this dish a stand-out is the sauce, which comes from the chicken drippings during the slow cooking process. Add a little butter at the very end, just before serving. This will create a buttery richness that will bring everyone back for seconds. Individual bowls: First, I layered the fresh spinach on the bottom of individual bowls. Then I added the hot rice so that it would wilt the spinach perfectly. 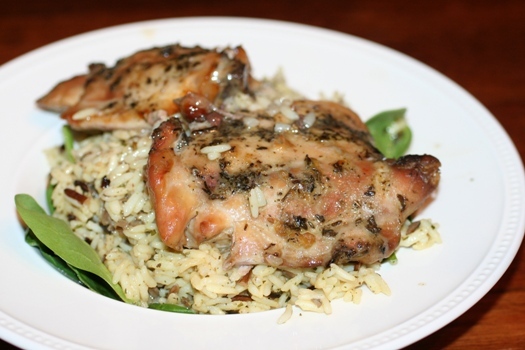 Top with a portion of herb chicken. Take the hot juices from the crock pot and pour over each. Serving platter: Set the stage for family-style serving when you arrange spinach on a serving platter, then layer with hot rice. Top with the chicken portions. Pour the juices from the crock pot into a gravy bowl to be passed around the table and added separately as desired. 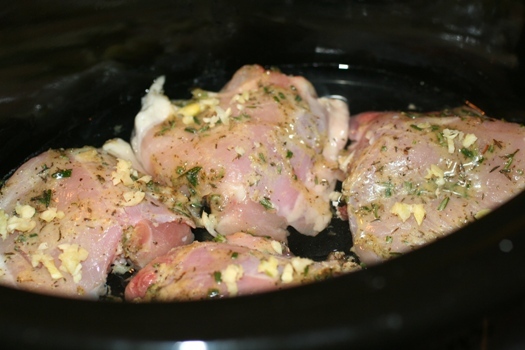 Put chicken into crock pot and rub with mixture. Serve chicken and it's juices over spinach and rice. The more liquid you put over the bowl, the more the spinach will wilt. 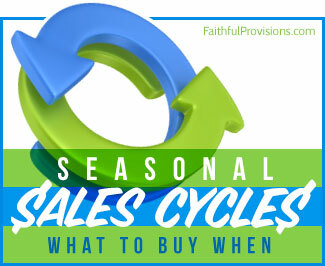 Find more Slow Cooker Recipes here on Faithful Provisions. Would there be a way to cook the rice in the slow cooker with the chicken for less dishes and more flavor? You could, I would add it about 2 hours before you want to eat, but know that it will soak up most of the juices. I would recommend to cook the rice separately in some chicken stock and spices. 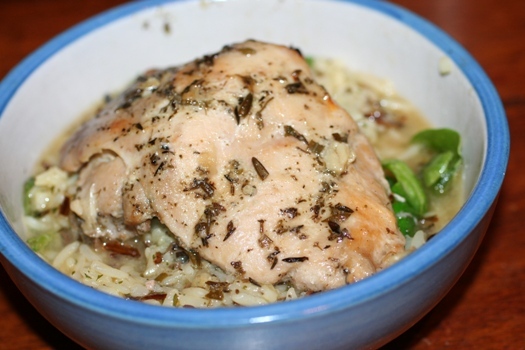 I had a recipe that used chicken thighs but I can’t find it! I’ve never bought/cooked them before so I was hesitant to try something outside the box especially without a recipe…but I modified this recipe a tiny bit. I didn’t have dry mustard..so left that out. I did 1/2 c white wine and 1 1/2 c chicken stock. I added a bunch of julienne strips of all kinds of sweet peppers (yellow, orange, red) and a whole green pepper in strips and just threw them in on top of the chicken. My plan is to make jasmine rice as a side. or for UNDER if the chicken shreds. And I didn’t even start mine til 4p…so it’s on HIGH…and we plan to eat around 9. thank goodness it’s summer and bedtimes are a thing of the past! LOL. As for Robin’s question. I am HORRIBLE at making rice. It never turns out right…so I don’t do it in crock pot ever…but bet it COULD be done..but getting the liquid to rice would be tough because the chicken still needs enough to simmer in and absorb all those great spices. Will let you guys know how it turns out. I agree on the rice, I would definitely cook it separately to preserve the wonderful chicken liquid to pour over the top! Where does the rice and the spinach come in? All placed in Crockpot? Or prepared separately? I added additional instructions, but you would place spinach, then cooked rice, then put the chicken and stock over the top to wilt the spinach. With adjustments, I think it will be very good. I’ll give it another shot some time but because I had to waste time, money, and food, 1 star for now. Yuri, I am so sorry it didn’t work out for you! I adjusted the recipe to reflect less white wine. When I made it, I used this amount and it worked out great, my slow cooker my burn at a higher temp, so I’d try 1/2 next time. The spinach is only slightly wilted, but if you put more liquid and let it sit a few minutes, it will wilt nicely. 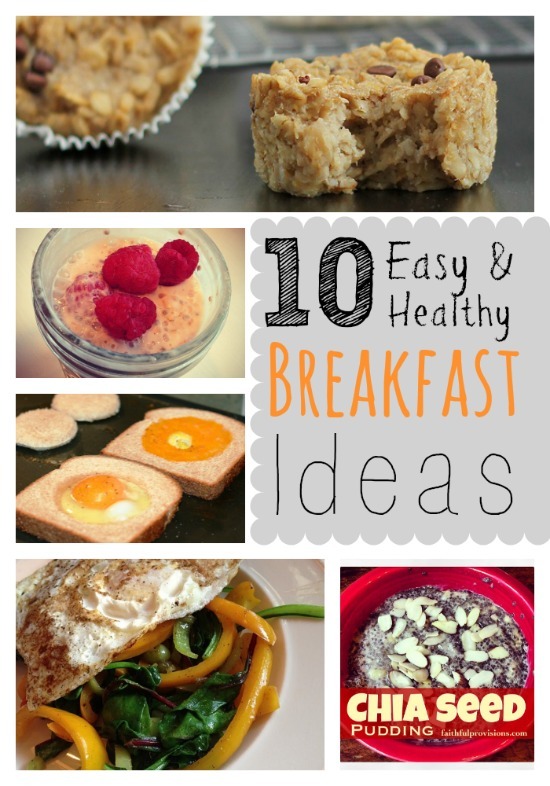 What would you say to using noodles, either egg or angel hair, instead of rice. Husband is diabetic and rice really messes with his numbers?